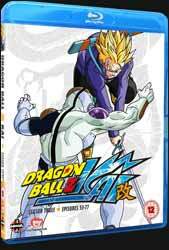 Dragon Ball Z Kai: Season Three (2009) continues the revamp of the original Dragon Ball Z series with various changes made so that the show, among other things, better followed the original manga. The new version also sports a new HD print as well as a new audio track for both the music and the vocals and changed opening and closing sequences. The Kai in the title translates as ‘updated’. This four disc Blu-ray set covers episodes fifty-three to seventy-seven and follows the same format as the previous Blu-ray. The audio options are either Dolby TrueHD: English 5.1 or Dolby TrueHD: Japanese 2.0, with optional English subtitles. Which you choose is going to be very much a personal choice. The English dub is good and has the superior sound separation, whereas the Japanese may appeal to the purists as it reunites as many of the original vocal actors as possible. There is very little in the way of extras with disc two and four having textless opening and closing sequences as well as trailers for other shows. Like the previous sets, Kai continues to show only the episodes which correspond to the manga, leaving out all of the filler arcs. This latest set sees the culmination of the battle between Goku and Frieza on the disintegrating planet, Namek. Follow the epic battle Goku is missing, but his remaining friends are informed by the Trunks that the androids are on their way. What was good and bad about the previous release remains, the new effects are a welcome addition, but this still occasionally create jarring transitions between the old and new material. This is one for the fans and completists.